INDIE SPIRIT: "Literary artists are not given as much voice as our musicians and actors," observes Falloon-Reid. As she fine-tunes preparations for the second staging of the Independent VoYces Literary Fair (which she established a year ago) and celebrates the warm reception for her latest book, Here’s A Hundred Dollars...Buy Yourself A Life, Judith Falloon-Reid argues that there is just too much literary talent in Jamaica that’s either gone unrecognized or yet to be discovered. She speaks with TALLAWAH about her role in giving voice to local writers, mixing fiction and fact in her own writing – and what impresses her most about, of all places, Antarctica. 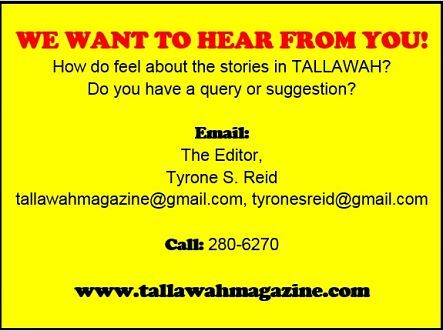 TALLAWAH: Speak a little about the vision that has brought the Independent VoYces Literary Fair roaring to life. Falloon-Reid: It’s an idea that I’ve had for years, but it wasn’t until 2003 when I published my first book that I realized there was no outlet here for unknown authors to get recognition for their work and to get into book fairs. So the idea popped into my head to help other writers who might be in a similar position. When I came home from Florida, after doing some promotion for the book, I further discovered that there are some incredible unknown literary talents here, and I believe that every voice must be heard. So I met with friends, who loved the idea of starting an event of this kind to provide a platform for unknown voices. And it really took off with the first staging last year. In spite of the pouring rain we had over 300 people attending. And so it became clear that [Independent VoYces, held in Robin’s Bay, St. Mary] is something that people really need. Right now we are planning to roll out some other programmes later in the year to benefit local authors. TALLAWAH: Why is this event important to our Jamaican culture? Falloon-Reid: It’s very important for us because we have a lot of talent in this country, and I feel that the literary artists are not given as much voice as our musicians and actors. There are writers in Jamaica who have written some really great works and sometimes when their names are mentioned, people ask ‘Who is that?’ They are still unknown. With Independent VoYces you don’t have to be well-known to be featured. In fact, we prefer if you are relatively unknown. We are going to help you get your name and your work out there. We have taken on that mantle of providing a platform for Jamaican writers. TALLAWAH: You chose the inspirational route for your recently-released fiction debut, Here’s A Hundred Dollars, and your previous efforts. Why? Falloon-Reid: My fiction is what I call ‘reality fiction.’ [Here’s A Hundred Dollars] is my first fiction book, my first novel. The first two books I wrote are inspirational. So in writing the novel I drew on my experiences and that of several other people. All of it is real but written as fiction. It’s the first of what I call a trilogy. I’m a Christian but I believe that my inspiration or message doesn’t have to be ‘Get saved.’ I believe that part of being a Christian is to uplift people. Uplift them from a reality standpoint to greater things, a better life, a life with some joy. Falloon-Reid: Currently I’m working on the second book in the trilogy, which was requested by some of the people who have read the first book. They say they want to know what happens to the characters. So that is what I am presently working on. I also have a pictorial project that I hope to release called Aah, Inspiring Antarctica: A Jamaican On Ice, which is about my experiences in Antarctica in 2008. TALLAWAH: Sounds interesting. What was it like in Antarctica? Falloon-Reid: It was fascinating. It’s all black and white, but the sunsets are the most beautiful I’ve ever since.